Another photo from my Photo Walk two weekends ago. Spotted these Adirondeck chairs in front of someone's front patio. They do not look comfortable to sit on, but these chairs remind me of laid back afternoon just watching the world go by. According to Wikipedia, here is some background about the Adirondeck chair. "An Adirondack chair or Muskoka chair is a type of chair favored in rural, outdoor settings. The precursor to today's Adirondack chair was designed by Thomas Lee in 1903. He was on vacation in Westport, New York, in the heart of the Adirondack Mountains, and needed outdoor chairs for his summer home. He tested the first designs on his family. 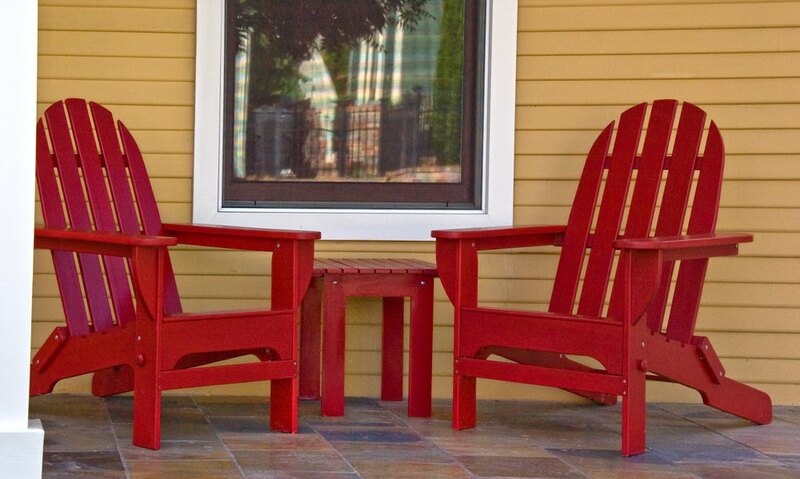 The original Adirondack chair was made with eleven pieces of wood, cut from a single board. It had a straight back and seat, which were set at a slant to sit better on the steep mountain inclines of the area. It also featured wide armrests, which became a hallmark of the Adirondack chair." we don't have chairs exactly like those but I wouldn't mind having one or two in my backyard. beautiful historic chairs, all I would need are a cushion, good book and a cool drink and I'd sit out all day relaxing ahh. Great pic. I like to squeeze ourselves into the chair. Yeah, these chairs definitely don't look comfortable to sit on. They're really eye-catchy though! Something about chairs on a patio is very calming. I've sat in them and you are right they are not that comfortable but the wide arm rests are very handy.